My thoughts This is my next to last Bond on blu-ray from the Bond 50 box, and one of my least favorite Bond movies. While both Roger Moore and Christopher Lee are quite good, there are several reasons why I don’t particularly like this movie. First of all, I never really liked Moore for Bond. I read most of the Bond books during Connery’s reign, and I just didn’t think Moore was the right person to play Bond. Secondly, the script had too many silly jokes. Clifton James as Sheriff J. W. Pepper was bad enough once, making him return here was adding insult to injury. Nick Nack was pretty silly, too. If it hadn’t been for Denise Richards in The World is Not Enough, I would have said that Britt Ekland was the worst Bond girl ever. Fortunately Maud Adams was very good, so we Swedes don’t have to be totally ashamed. To top it off, the filmmakers had to ruin a great car stunt - the 360 flip - by adding a silly sound effect. The only Bond films I liked even less were Moonraker and Quantum of Solace. Moonraker because it was even sillier than TMWTGG, and QoS because it bored me to the point that I fell asleep. Maybe I need to rewatch that one, but I don’t think it will happen any time soon. I agree about Moore. I loved him as 'The Saint' and all the way to his bit as "North Sea Hijack" which was quite good fun. Connery will always be James Bond for me - the others are okay but pale in comparison. I also grew up with Connery, so he'll always be the Bond for me. But Craig isn't bad either. As you said, David, Roger Moore was great as Simon Templar. I didn't care for Lazenby. Dalton was tough enough, but lacked something. I rather liked Brosnan, but some of the scripts were not up to par. I hated Quantom of Solace, but that wasn't Daniel Craig's fault. 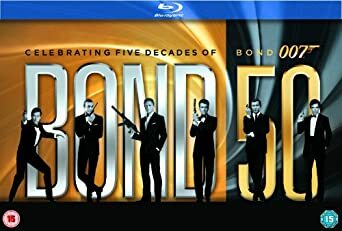 I bought the Bond 50 set earlier this year and go slowly through it. The extras are awesome, and plentiful. When I grew up I got to know Onnery first, which may be part of why I like him the most. Lazenby is the worst Bond in one of the best Bond films. So far Moore clearly has the largest share of duds. But I really liked For Your Eyes Only; IIRC it was the first Bond I saw at the cinema. Dalton is good, but the material he's given fails. License To Kill is a good movie, but not a good Bond film. I have never seen any of the Brosnan's films. Craig is great, although Quantum of Solace severely lacked... Skyfall is one of the best Bond films thus far for me as well. I thought Pierce Brosnan was good as Bond, but the quality of the films was variable. But then again I guess you could say the same about Connery, Moore and Craig. My favorite Brosnan Bond movie is Goldeneye. And not just because it has another Swedish Bond girl - Izabella Scorupco - although she is quite good. And hot. And there's Famke Janssen as Xenia Onatopp. That's a character name that I think Ian Fleming would have approved. In The Spy Who Loved Me, yes. In Moonraker, no. Overview As ancient Transylvania struggles into modern times, old myths and superstitions blur with reality. Two American students, Michelle and Lillian, join their Romanian friend Mara in the Carpathian Mountains to study the legends of vampires. To claim his birthright – the ancient Bloodstone – Radu kills his father and hunts his noble half brother Stefan. With Stefan's help, the girls fight for their lives against Radu and his minions – the Subspecies – an army of hellish creatures born of his own flesh. Will they survive to see the sunrise or will Radu curse them to eternal night? My thoughts I have mixed feelings about Subspecies. On the plus side - and this is a big plus for me - it's vampires done right. Radu (Anders Hove) is evil through and through. With his long fingers he looks quite a bit like Nosferatu. And the story itself isn't bad. And they put the Romainian locations to good use. So far, so good. But there are quite a few things on the minus side. Most prominently the subspecies. These small creatures were initially done by actors in red suits. But these sequences were deemed not fantastic enough, so David Allen was tasked with replacing them with puppets. The big problem was that he had no background plates that were shot with this in mind, so he had to use whatever footage from the Romainan shoot that could possibly be used. The result is that the title creatures don't actually do very much, storywise. And the quality of these special effects is variable, to say the least. Then there is Angus Scrimm. Wait, was Scrimm in the picture? Oh, right, he's the vampire king that gets knocked off right at the start of the film. And for that he gets top billing. That doesn't leave a whole lot in the acting department. Oh, Anders is probably a capable actor, but this film doesn't really focus on his acting but more on his looking scary. Which he does. The females look good, and that's fine, but none of them have any particular acting skills. A check of their resumes on IMDb confirm my suspicions. None of them have more than 10 titles to their name. The films generated three direct-to-video sequels. 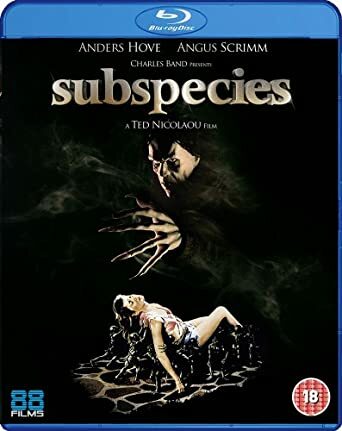 I haven't seen any of them, but I wonder if any of them actually featured the titular subspecies. I rather suspect they didn't. They did feature Anders Hove as the vampire Radu, though. So, in conclusion, a bit of a disappointment, but not without interest. Recommended if you prefer Nosferatu and Christopher Lee's Dracula to True Blood. I was never a great fan of Ingmar Bergman. It pains me a little to confess to this. As a Swede and a film lover it feels almost like treason not to totally embrace our foremost film director. Maybe I started too soon and/or with the wrong film. I was sixteen when The Silence opened, and since it was very controversial and I was very curious, of course I went to see it. And I didn’t like it at all. It took me a LONG time before I felt comfortable watching another Bergman film. So far I’ve seen Summer with Monika, The Sevent Seal, Wild Strawberries, The Virgin Spring and Fanny and Alexander. And The Magic Flute, but that doesn’t really count. I’ve seen parts of other films on TV, but I feel that they’re just not for me. I have my own demons to wrestle. Not as many as Bergman, perhaps, but I don’t want to take on his as well. I may go for some of his earlier films that are not so dark, we’ll see. I do get upset when people put down Bergman and his films, though. On IMDb someone wrote about Wild Strawberries that it was ”Second worst film of all time, after The Seventh Seal”. I’m ok if someone says ”I didn’t like it” or ”I didn’t get it” or something like that. But anyone with half a brain should understand that films don’t get reputations like these have if they are bad. That statement is so disrespectful. Personally, I didn’t like 2001, but I certainly wouldn’t attribute that to the film being bad. Overview Traveling to accept an honorary degree, Professor Isak Borg—masterfully played by veteran director Victor Sjöström—is forced to face his past, come to terms with his faults, and make peace with the inevitability of his approaching death. 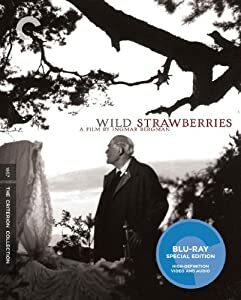 Through flashbacks and fantasies, dreams and nightmares, Wild Strawberries dramatizes one man's remarkable voyage of self-discovery. This richly humane masterpiece, full of iconic imagery, is a treasure from the golden age of art-house cinema and one of the films that catapulted Ingmar Bergman to international acclaim. My thoughts Bergman had many strengths. Not only was he a great director, but he wrote all of his films himself, and he surrounded himself with the best people in the business, both in front of the camera and behind it. Wild Strawberries is no exception. The word Smultronställe has been used since the early 1900s to describe a place that you like to come back to and that is not so easy for others to find. A Smultronställe is a place where you feel good and can relax, a place that you can go to when you're stressed and have too much to do. Examples would be a café with special style, a clearing in the woods or a place, not so well known, that has a nice view. So, although wild strawberries (smultron) are a part of the story, the title means much more than that. When the old man (Victor Sjöström) remembers his childhood, the place where he grew up is his Smultronställe. I don’t like to analyze films, so I won’t even try with this one. I can just say that I liked it a lot. Perhaps in part because I too am getting old. Not as old as the man in the film (he’s 78, I’m 66), but old enough to realize that most of my life lies behind me, and I too can look back and be sentimental. Another reason is Bibi Andersson. I always liked her. Possibly in part because she reminds me very much of my first love who was also blond, beautiful and called Bibi. You never quite get over the first one, do you? This is a beautiful film, and rather more accessible than some of Bergman’s later works. It may not be my all time favorite, but it certainly ranks among the top 20. The Criterion release also features a 90 minute interview with Ingmar Bergman by Finnish writer/producer/director Jörn Donner. It’s really interesting, and nearly as good as the film itself. Very highly recommended! Overview From acclaimed South Korean writer/director Kim Jee-woon (A TALE OF TWO SISTERS, A BITTERSWEET LIFE) comes the wild western saga of three strangers – a bounty hunter (Jung Woo-sung of THE WARRIOR), a ruthless assassin (Lee Byung-hun of G.I. JOE: THE RISE OF COBRA) and a bumbling thief (Song Kang-ho of THE HOST and THIRST) – chasing a stolen treasure map across 1930's Manchuria. But in a lawless frontier where bandits, gangsters, and the Japanese army all battle for control, which double-crossing gunslinger will blast his way to victory? From its spectacular opening train robbery to the final white-knuckle showdown, experience the international action smash that Quiet Earth calls "Outta this world...A brilliantly executed ballet of violence and adventure that'll have you picking your jaw up off the floor many times before the credits roll!" My thoughts This has languished in my unwatched pile for some time. Well, three years, actually. One reason that it took this long is probably that it takes a little more concentration to watch a film that’s subtitled in a language that is not your first language. And if the film is over 2 hours long, it’s not something I start watching just on the spur of the moment. But I’m glad that I finally got around to watching it. A Korean western style movie is not something you come across very often. I call it ”western style” because it’s not a western in the strictest sense, since it doesn’t take place in the west. It’s set in Manchuria in the 1930s. The mix of the western style and the 1930s vehicles and weapons feels a bit anachronistic. The films is on occasion rather confusing. In the big shoot-outs it’s hard to tell who is with who and sometimes also why they are there in the first place. It’s also very violent. A bit too violent for my taste. But even though it’s over two hours long, it never gets boring. It’s almost non stop action. The actors are very good, and the director certainly has style. This has whet my appetite for more of his films. I’ll have to look up what else is available on DVD/BD with English subs. So, when you’re in the right mood, this is a very enjoyable film, despite a few cons. Definitely recommended. The new UK Bluray release of Brides of Dracula has been criticised because of the framing. It is framed 2.0:1. The old DVD release was framed 1.66:1. I know that many of Hammer's films were shot with different framings in mind, so they could be shown both 1.66 and 1.85. I don't think they were ever intended to be shown 2.0:1 though. The interesting thing is that although the BD image is cropped at top and/or bottom, it does show a tiny bit more on the sides. So this is a sort of Pan & Scan, but vertically. So does this impact the viewing of the film negatively? If you are very familiar with how the film should look, probably. If not, then chances are you wouldn't react. But still I don't understand why they did this. Why not at least settle for 1.85 or 1.78? Still, the BD has better picture and sound quality, so that is a plus. So, is this an upgrade for you? Depends on how much of purist you are. Even the DVD that comes with this combo looks better than the old DVD, but not by that much. The BD is locked to Region B, so it is probably not interesting to people in the US, unless they have a region free Bluray player. Hopefully there will be a Region A release with better framing. Overview Mysterious events surround the sudden appearance of a gaping fissure in Scotland: soldiers on manoeuvres nearby develop a debilitating sickness and a small boy is later engulfed by an eerie presence. The child subsequently dies of first-degree radiation burns, similar to those that killed one of the soldiers. X the Unknown was only the second of Hammer's horror productions, but contained some of the most grisly and disturbing special effects seen in any of the company's films. 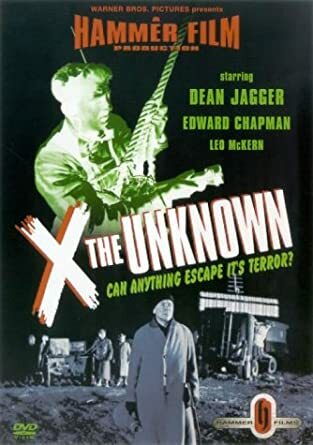 This DVD features the original uncut British theatrical print of X the Unknown and bonus material featuring the film's screenwriter Jimmy Sangster. My thoughts I was reading in my Hammer books about X The Unknown and I felt that it was time to watch it again. Some people call this Science-Fiction, others call it Horror. I would lean towards Horror, because as far as the ”science” goes, the script is just about as scientifical as Dracula or Frankenstein. That doesn’t make it a bad film, though. It seems that writer Jimmy Sangster thought it would be interesting with a ”monster” that didn’t come from outer space, but rather from inner space. And if you just ignore that the science is bogus, it’s a rather exciting story. For most of the film you don’t get to actually see the ”monster”. There is a crackling sound and some weird lights and peoples horrified reactions. And when you finally see it, it kind of resembles The Blob. Except it eats energy and not people. The film was supposed to be directed by Joseph Losey, but it’s american star, Dean Jagger, flat out refused to work with Losey because Losey was blacklisted by the House of Unamerican Activities (senator McCarthy’s witchhunt on communists). So Leslie Norman was called in as a last minute replacement. Except for a codirector credit in 1939, Norman only had one previous directorial credit, the thriller The Night My Number Came Up (1955). Apparently Norman was not well liked by the cast and crew, and the shoot was not a happy one. But in spite of that, the film is quite good. Hammer had had a success the year before with The Quatermass Xperiment starring Brian Donlevy. And they wanted a follow-up. But Professor Quatermass was Nigel Kneale’s creation and Sangster couldn’t use the name withoug Kneale’s approval. So instead we have Dr. Royston, played by Jagger. Leo McKern is also good as Inspector McGill from the Atomic Energy Commission. And of course my Hammer favorite Michael Ripper has a small part as an army sergeant. On first viewing I gave this film 3/5, but now when I watched it again I actually liked it a bit better. Highly recommended if you’re a Hammer fan. Still recommended if you’re not. Yesterday evening I decided I felt for some comedy and and a detective story. So I picked up Laverne & Shirley, season 3, and Honey West, the one and only season. So I watched ep 4 of L&S - Robot Lawsuit. Then I watched the next unwatched episode of Honey West, ep 25 - The Fun-Fun Killer. And to my surprise I found that this one was about a robot as well. As far as I know, these are the only robot episodes of these two shows, and I just happened to get to them the same evening.